Stampin' Up are giving us an early Christmas present! Starting tomorrow, you will be able to order the Thoughtful Branches stamp set and co-ordinating framelits. It is a Limited-Time Only Bundle available to order only from 2-31 August, and only while stocks last. There is a beautiful Photopolymer stamp set and co-ordinating set of framelits, available separately or as a bundle. Demonstrators were able to order this set early, so I've been having lots of fun playing with it, and no doubt you've seen other sample projects popping up on the Internet. Those coming along to my August classes will be able to try it out for themselves. We'll be using this set in all my classes this month. This card isn't a class card (I'll show you those next time). I made this one just for fun. 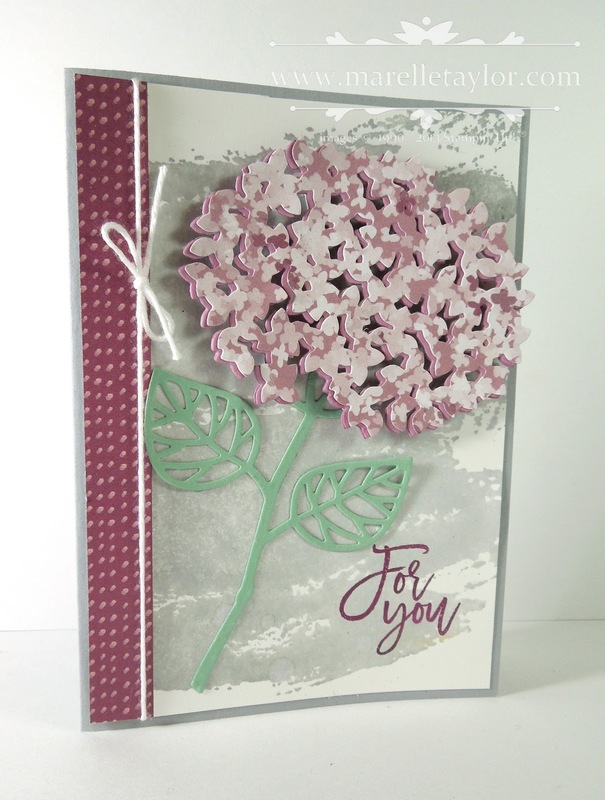 I've cut out the Hydrangea petals from a piece of the Blooms and Bliss DSP, and attached it to a plain piece of Sweet Sugarplum cardstock, slightly offset for added depth. TIP: the foam adhesive strips are very handy for mounting intricate dies like this, as they are thinner than dimensionals. They are more raised too, which adds extra wow factor.